It’s easy for us Earthlings to imagine life evolving on planets like ours. But there are exoplanets out there that strain the imagination. Take “eyeball planets”, which are half frozen, half broiling with the heat of their suns. 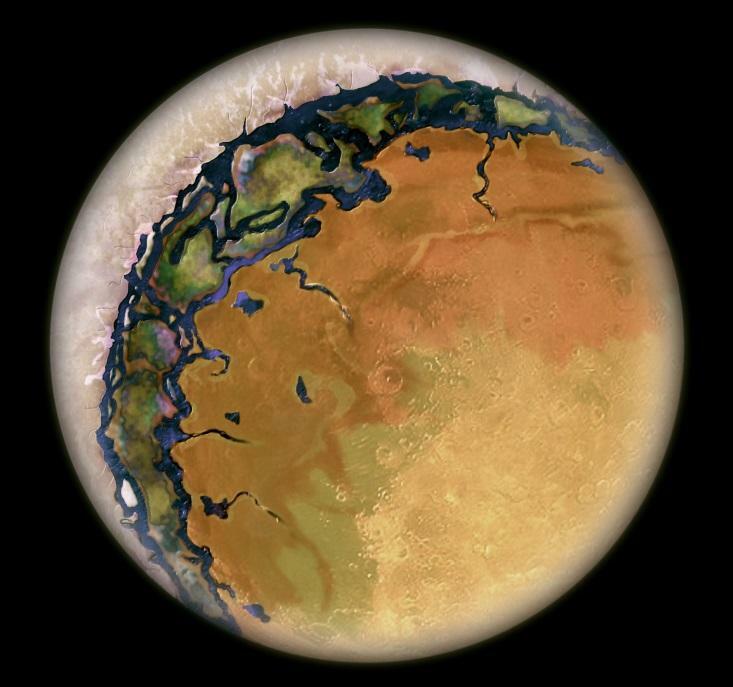 Earthlike planet Zarmina, in the Gliese system, is one of these. We shouldn’t rule these bizarre planets out from our search for life. Over at Nautilus, astronomer Sean Raymond has written a fascinating piece on what eyeball planets could look like. You might also know them as tidally locked planets, or planets whose same hemisphere is always facing the sun. The hot spot that is the always closest to the sun is the “pupil” in this eyeball analogy. Eyeball planets can come in two types, hot and cold, depending on how close they are to their star. Here’s how Raymond describes them. Where on a hot eyeball planet could you live? It’s a classic Goldilocks story. The day side is roasting and dry. The night side is frigid and icy. In between, it’s just right! The sweet spot — let’s call it the “ring of life” — is at the terminator, the boundary between night and day. The ring of life is bounded by deserts on one side and ice on the other. There is a constant flow of water from the night side to the day side — a series of rivers, all flowing in the same direction. The Sun is fixed in the sky right at the horizon, and the area is in permanent light. Conditions are pretty much the same all the way across the ring of life. One can imagine vegetation following the rivers onto the day side until they dry up, with different ecosystems interspersed along the way. There could be mountains at the edge of the ice sheets, since the ice-covered continents would be heavily weighed down. Icy eyeballs are also tidally locked to their stars, though their orbits are larger than those of hot eyeball planets, and heat is in short supply. What icy eyeball planets do have is an abundance of water — the night side is covered in ice, and there is enough stellar heating at the substellar point for water to remain liquid. There is essentially a large pond in the midst of a global icy landscape. Below the surface ice, the ocean covers the entire globe. It is similar to Jupiter’s moon Europa, but with a large hole in the ice.